Valiant’s 2016 Convention Tour Heads to Calgary Expo with Exclusive Merchandise, Panels, and More! This weekend, the Valiant 2016 Convention Tour is crossing the border for Calgary Expo 2016 – and we’re bringing along a fleet of merchandise, programming, panels, and the best-reviewed comics in the industry! From April 28th to May 1st, join Valiant inside Calgary’s Stampede Park in booth #904 for a first-hand look at why Valiant is sweeping critics and fans around the world with a complete selection of Valiant trade paperbacks and deluxe hardcovers for award-winning titles, including X-O MANOWAR, BLOODSHOT REBORN, RAI, DIVINITY, ARCHER & ARMSTRONG, HARBINGER, and many more! And don’t miss the bundles of new Valiant merchandise unloading into Calgary, including t-shirts and more featuring Valiant’s awe-inspiring universe of characters! 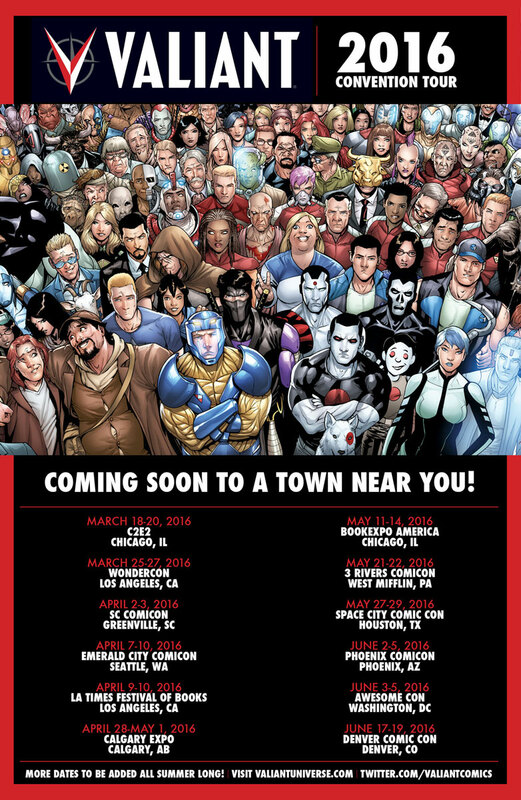 The weekend blasts off on Thursday, April 28th at 5:45 p.m. MDT in Palomino H for VALIANT 101: NEW FANS START HERE! You’ve heard the buzz… You’ve seen the reviews… Now find out where to start with Valiant Comics! From X-O MANOWAR to NINJAK to THE DEATH-DEFYING DR. MIRAGE and ARCHER & ARMSTRONG, jump on board here with a concise and fun-filled introduction to Valiant’s biggest, most memorable characters…and find out for yourself why Buzzfeed calls Valiant “a universe full of your new favorite superheroes”! Then, Calgary’s biggest comics convention journeys to the 41st century on Saturday, April 30th at 10:45 a.m. MDT in Palomino C for Valiant: The Summer of 4001 A.D.! This summer…the future of Earth will be decided in the stars when Valiant presents the blockbuster crossover event of the year in 4001 A.D.! Now, get primed for the epic showdown between Rai and the forces of New Japan right here! Plus: Don’t miss an all-new round of news and announcements for ARCHER & ARMSTRONG, BLOODSHOT REBORN, DIVINITY, FAITH, NINJAK, X-O MANOWAR, and more! We’ll see you in the Stampede City! And don’t miss a moment of the action as Valiant’s one-of-a-kind convention road show storms on through Houston; Denver; Phoenix; Washington, D.C.; and more all summer long!